One of my students didn’t want the breakfast so I thought, “Perfect photo opp.” I opened up the sack and immediately was hit by an aroma of hot sandwich. I could have gobbled it down right there on the spot, but I’d rather not make a run to the bathroom a couple hours later (I always thought it was just “fiber” causing me to run to the bathroom. Since going gluten free after the project ended, I realize that it was gluten). I don’t know what the ingredients are in the sandwich (since I don’t have access to ingredient information), but the aroma was tempting. I think I was a little on the hungry side. And how is the jelly supposed to be used exactly? As a dipping sauce for the sandwich? I can’t say. 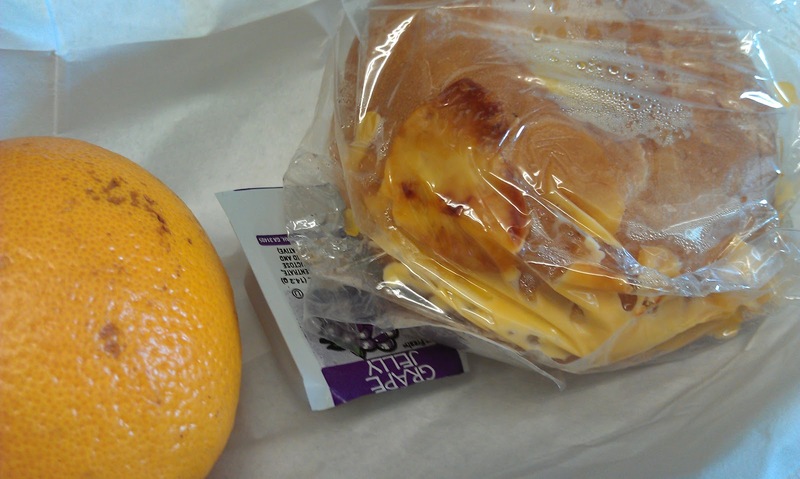 Another concern: the sandwich was heated up in plastic. That’s a worry, but sadly I’m not sure it can be avoided. My school has a kitchen, but it’s small. Everything is trucked in and meant to be heated up. Actually many schools don’t have large kitchens (and some don’t have cafeterias) because they were built in a time when children went home for lunch. Any ideas on how to eliminate that packaging? After I blogged about one of the previous breakfast sandwiches served at my school, where I sort of slammed the breakfast sandwich, I tried to make one at home on the weekend. I made an open sandwich with a egg (over easy) and salami. It was really, really tasty. I wish I had time to do that every morning! At least there's fruit included. That's more than I can say about my school breakfasts. Some people spread a little jelly on a breakfast sandwich, it's an acquired taste but pretty normal in some places. Kinda like a Monte Cristo! Thanks for taking the time to talk about this, I feel strongly about this and I enjoy learning about this topic. Please, as you gain data, please add to this blog with more information. I have found it very useful. .
i am not an expert in any way on how money is distributed to schools, but perhaps it could be put into re-doing the school kitchens so that food could be cooked instead of heated in plastic?!? that is seriously disturbing to me. my son will be going to kindergarten next year, where there is a cafeteria. we will have the option of sending his lunch or letting him eat in the cafeteria. they offer a salad bar, but he "hates" salad. after seeing the menu of "bosco" sticks (whatever that is), corn dogs, "beef" ravioli, hamburgers, etc., thank goodness we have the option to send his lunch. oh, and did i mention that this is a private school? i know that doesn't necessarily mean rich, but since we are paying above and beyond, shouldn't we expect just a LITTLE more? So do the kids *have* to take a breakfast? I think giving it to kids who want it is a great idea, but I can't get behind the idea of serving food to kids who have already eaten breakfast. 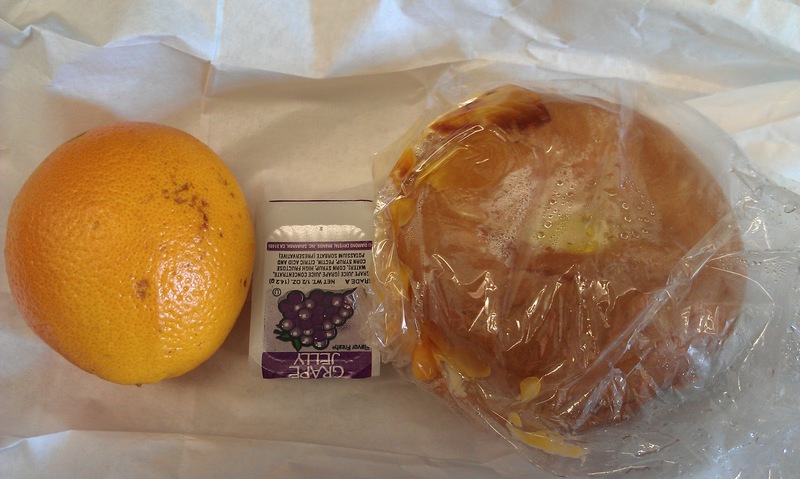 Most likely the jelly is included so that the meal will reach the currently required minimum number of calories for a school breakfast, which is 554 calories. Mrs. Q! Has anyone commented or told you about the movie "Forks Over Knives" yet? I was lucky to attend the Chicago premiere last night (it opens in theaters on Friday,) and there was a small segment about school lunch. I highly recommend it, if you or any other readers get the chance to see it. They heat most of this stuff in big industrial ovens, not microwaves, right? Why not use foil? Safer than plastic, and recyclable too. One of my husbands favorite breakfasts that I make for him are breakfast sandwiches…eggs, bacon and cheese on a bagel. It's not all that healthy. My daughter is hung up on bagels and cream cheese with dry cereal on top. Weird…I know. But I'm usually just glad to send her out the door having eaten something. As to how they can reduce the whole packaging, just go restaurant style. Keep the sandwiches done in trays in a hot box (that's the way they get transported, no? And if not, transport them all together -without individual packaging- and then heat them up with heatlamps or something half hour before the students' lunch time). That way, the sandwiches can be stacked up or presented in trays and the kids can pick them with tongs and what not. That'd get rid of the packaging… and waste, for those kids (or adults like myself) who cant figure out what to do with the jelly. Wow, you actually weren't a snob in your food post. I am shocked. You actually made something us commoners eat: a breakfast sandwich. Are the glass walls crumbling in your house? @TJ That's how my school served us! @Connecticut WTF is your problem? That was extremely rude. She is not snobby at all. Yes, she can to be a snob. Your blog has gotten me to thinking back to my days as an elementary school kid. A bit of reminiscing. I was in elementary school in the late 70's/early 80's. My school had about 100 kids and there was a dedicated group of ladies that cooked breakfast and lunch for us. I typically had to take my lunch because my family couldn't afford the school food program. It was a special treat to be able to eat the breakfast & lunch along with my classmates. I remember the food being cooked in a tiny corner of our gym/lunchroom. Ahhh good memories. Things sure have changed…. Thank you for the message your blog is sending. Umm…ew. I don't think I could eat that breakfast sandwich. I mean to each his own, it's not like I'm a 'snob' like some others suggest you are, but that I can't even stomach the thought of that for breakfast. We are toast and cereal people here, which suits us just fine. When I do make home made breakfast sandwiches, we eat them for dinner with side salad. Heated in plastic bothers me…I can just imagine all the chemical crap. Yikes! If they MUST come wrapped in something, why not foil? Not only would the grody plastic toxins not be present, but foil keeps food hotter longer. Jelly? Seriously? Seriously? Weren't we JUST all bitching about added sugar in milk? Now they're suggesting that kids take gelatinous fruit-flavored sugar and slather it all over a greasy breakfast sandwich too? I also second the question about breakfast in the classroom: are all students given breakfast, like it or not? I could have sworn you said earlier that it was optional, but if it IS optional, how did one of your students come to take a breakfast they had no intention of eating? Dana Woldow's comment that the jelly may have been added to bring the calorie total up to the minimum required for federal reimbursement brings up an interesting point. This requirement may have made sense when reimbursement requirements were formulated 60+ years ago but it hardly makes sense today and is one of many that need to be revised. The sooner, the better. Tick tock. @ TJ Im pretty sure the sandwich probably came in that plastic. For some reason everything in this country needs to be individually wrapped. I don't understand it either but that's just the way it is. Hi Mrs. Q, here is something that I put up on twitter. Since I'm not a twitter person, I wasn't sure if you would see it. Breakfast sandwiches rock! I have a boy who swims competitively, and he absolutely needs serious protein in the morning. I just made a batch of 24 breakfast sandwiches: split whole-grain English muffin with a scrambled egg, Canadian bacon and slice of cheese. For a sedentary child who doesn't exercise, this would be an appalling breakfast. But for my budding athlete? Only when he has this kind of serious protein does he perform well in the classroom. And that's one more reason parents should be required to feed their own kids, rather than get free lunches purchased by me, the taxpayer. Every kid is different and should be fed accordingly.